Banal and sublime. Dumb and smart. Ordinary things are acquired in great quantity and obsessively assembled. The extreme tedium of producing each piece is positively breathtaking. On first impression, the work seems so easy and obvious, until a surprising intricacy of issues slowly emerges, revealing the many paradoxes that animate Devorah Sperber's current practice. Sperber has an eye for ubiquity in quantity. She is an indefatigable collector who is attracted to the potential of the mundane. 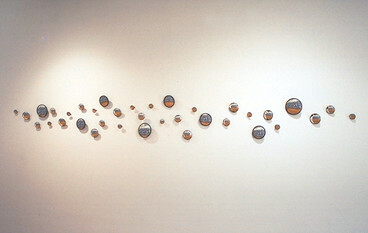 Startlingly, her creative materials include marker caps, spools of thread, tacks, stickers, and pipe cleaners. Her work requires vast material accumulations that are vividly tactile and spatial. But Sperber is no neo-Luddite, staunchly consigned to the palpable world. If not always the genesis of her work, the computer is an active agent and accomplice. In the physicality of this work, there is an ambiguous and compelling connection between the plethora of things and the formlessness of cyberspace. 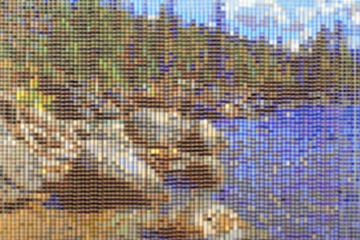 Sperber frequently scans landscapes, paintings, and other images with a computer program that produces highly detailed, pixilated "reproductions." These digital units form the blueprint for large pieces that will be built with thousands of very small things. 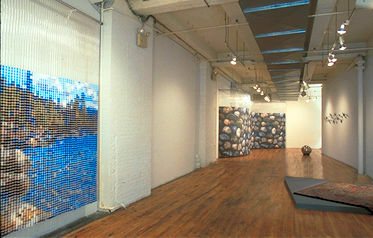 Reflections on a Lake (1999) and Virtual Environment 1 (1999-2000) are constructed from thousands of spools of thread. This is the plain evidence. The actual elements are curious, the colors saturated and seductive, and the sprawling scale shrewdly ambitious for most exhibition spaces. 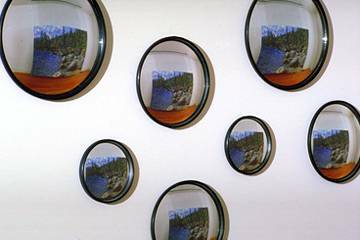 When installed, across the space, mirrors and other reflective optical devices, set at different heights and angles, transform the undulating surfaces of colorful spools into sentimental images of a rocky, forested shoreline and a rock wall. Thus, it is only when we turn and walk away from the work that their naturalistic character emerges. Sperber's art is insistently unstable: a glance or a physical shift this way of that dissolves the idealized precision of the scenic views. The Sublimity of an Alpine setting diminishes in the reality of so many of the same thing. In contrast to the opacity of these installations, VW Bus: Shower Power (2001) is shimmering and transparent. A common plastic shower curtain is suspended on a rectangular rack. There is a discernible pattern of color, and a closer look reveals the colorful plastic flower appliqués-at least 60,000 of them attached one by one by the artist. The abstract pattern, when seen as a reflection in a fisheye mirror on the wall, morphs into a boxy hippie-era Volkswagen bus. Continuing her preoccupation with that period, Sperber currently is working on a Shag Rug series. The first and largest work is eight by sixteen feet; it looks like a 1970s shag rug. 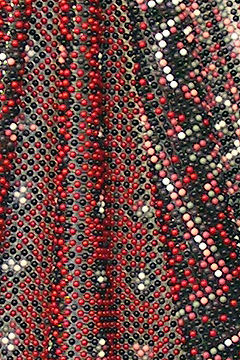 Made of 165,000 two-inch pieces of chenille pipe cleaners, the piece has another, clandestine identity. When we step back and contemplate it from distance or reflected in a convex mirror, a life-size rendering of Jackson Pollock's Autumn Rhythm: Number 30 (1950) comes into focus. The hagiography of modern abstraction is not exempt from Sperber's witty, acerbically probing analysis. With both intelligence and humor, she makes seeing a more critical and conscious act. Smart and funny. Devorah Sperber is a New York-based artist whose sculptures, composed of thousands of ordinary objects, negotiate a terrain between low and high tech. Her labor-intensive works explore repetition and the effects of digital technology on perception, scale, and subjective reality. p. 86-87. Reflections on a Lake, 1999. Installation. Detail: 5 of 36 convex mirrors. in the right forgreound is Lie Like a Rug. p. 90-91. Reflections on a Lake, 1999. 5,760 spools of thread. 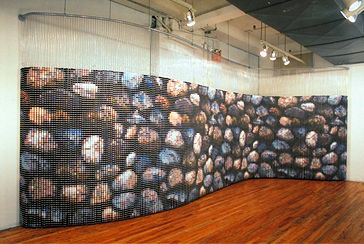 6 x 10 ft. (1.8 x 3m). From the installation Reflections on a Lake. p. 92. 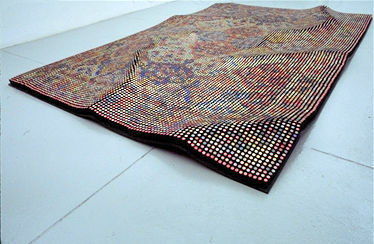 Lie like a Rug, 2000-02. 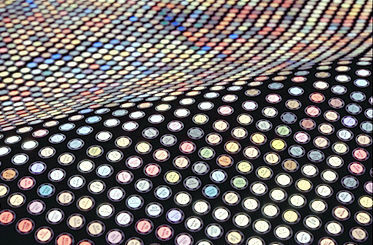 18,000 Letraset marker caps on canvas. 99 x 63 x 6 in. (251 x 160 x 15.2 cm). p. 92-93. Lie like a Rug. Detail. p. 94-95. Virtual Environment 1, 1999-2000. Installation. 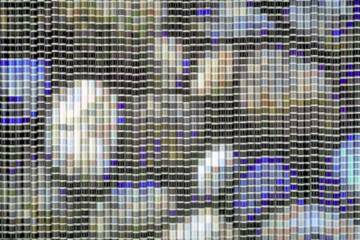 Detail: 36 convex mirrors. p. 96-97. Virtual Environment 1, 1999-2000. 20,000 spools of thread, clear vinyl tubing, EMT pipe, 21 x 8 x 8 ft. (6.4 x 2.4 x 2.4 m). From the installation Virtual Environment 1.
p. 96-97. Virtual Environment 1. Detail. p. 98-99. 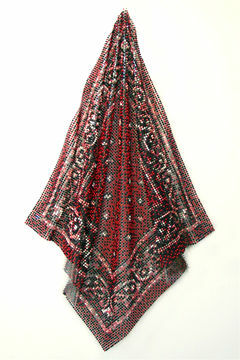 Red Bandana 3, 2001. 14,280 maptacks, clear vinyl. 36 x 21 x 2 in. (91.4 x 53.3 x 5 cm). p. 100-101. VW Bus: Shower Power, 2001. Mixed media. 5 ft. 3 in. x 11 ft. 4 in. x 6 ft. 7 in. (1.6 x 3.5 x 2m). p. 102-103. Shag Rug 165,000, 2002. 165,000 two-inch chenille stems and foam board. 3 x 192 x 96 in. (7.6 x 487.6 x 243.8 cm).